Student Residence Architects all over the world focuses increasingly more on these type of programs -university residences. This project designed by LAN architects consists of a series of buildings located in the Parisian neighborhood of La Chapelle from Paris. Beyond its primary function, the project proposes a new concept of sustainable urban integration and at the same time creating a friendly and informal complex.The building’s strategic position on the intersection of a number of streets and the busy nature of the district directed our research towards the development of lively, rich elevations providing views through to the center of the plot and an appreciation of this inner space. The Student Residence creation of two clefts and the transparency of the ground floor level resulting from the bike park meet this ambition, defining a project reminiscent of the buildings to be found in Paris’ inner suburbs. The project is based on the party walls defining the different building heights. This movement creates a square central courtyard providing the project with its key element. Thanks to its considerable size, the courtyard is a source of sunlight and acts as a green lung for the apartments. The circulation system is very clear: four vertical circulation points on the four corners of the plot. All circulation areas are naturally lit to allow the landings to become places where people can meet one another. 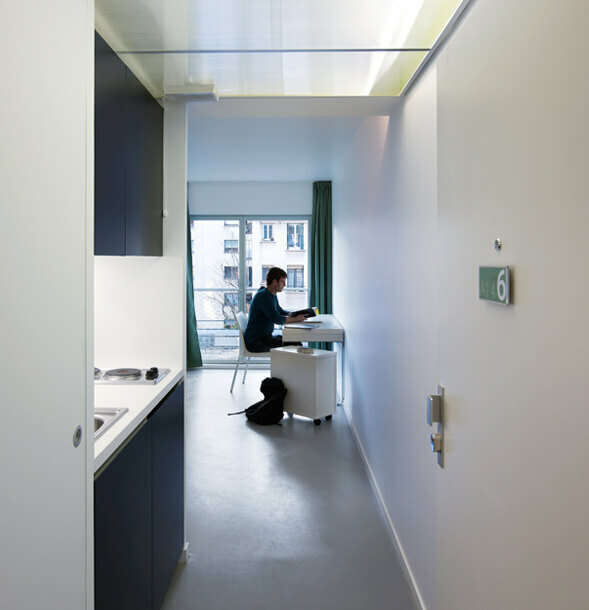 The design of the general layout was guided by a desire to provide bright sunlit units that are easy to live in and completely adaptable to the personal tastes of each occupant. The view over the courtyard will provide the peaceful environment needed for concentration and studying. Your’s is the intiglelent approach to this issue.